Hotwork Ejector Pins are precision ground and laser marked. Constructed from hotwork die steel, RHX Hard-Core(TM) Series H-13 Ejector Pins are hardened throughout to 50-55 RC and have surface that is ion nitrided to 65-74 Rc. Products, marked for identification, come in 1/32-Â½ in. dia and 6, 10, and 14 in. lengths as well as +.005 in. oversize and Â½, 2, 3, and 4 in. shoulder lengths. 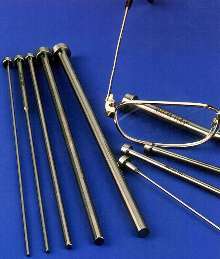 Diameter tolerances can be held to .0003 in., and pins eliminate flaking, cracking, and dishing. They are thermal resistant to 1,100Â°F. A full line of hotwork ejector pins that are hardened throughout, offered in 36 standard sizes, and marked for easy identification is available from Royal Diversified Products, Inc. of Warren, Rhode Island. RHX Hard-Core(TM) Series H-13 Ejector Pins are precision ground from hotwork die steel, hardened throughout to 50-55 RC, with the surface ion nitrided to 65-74 Rc. Laser marked for easy identification, they are available in standard 1/32" to 1/2" dias. and in 6", 10", and 14" over-all lengths, as well as +.005" oversize, and 1/2", 2", 3", and 4" shoulder lengths. Featuring diameter tolerances which can be held to .0003", RHX Hard-Core(TM) Series H-13 Ejector Pins are designed to eliminate flaking, cracking, and dishing. Thermal resistant to 1,100°F without the loss of physical properties, these hardened-throughout ejector pins are ideal for working with glass-filled materials. Custom TiN and Dicronite coatings are offered. RHX Hard-Core(TM) Series H-13 Ejector Pins are priced from $1.95 ea., depending upon size and quantity. Literature and pricing are available upon request.